Where did the Egyptian Gold come from? How was the precious metal obtained? The priceless golden treasures found in the tomb of King Tut have simply stunned people. This was the tomb of a relatively unknown and unimportant boy king but his tomb contained a priceless treasure of gold. What must the golden treasure contained in the tombs of more important Egyptian Pharaohs have looked like? 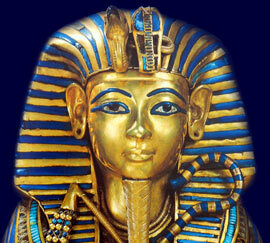 Much of the Egyptian gold treasure has been lost to the tomb robbers. But where did all of this Egyptian gold come from? Egyptian Gold was believed to have a magical potency and believed to contain significant religious properties. Gold did not tarnish or deteriorate. But more importantly gold shone like the sun god and was therefore credited with the powers of the sun god. Egyptian gold was therefore referred to as the 'Flesh of the Gods'. The golden treasures of the Ancient Egyptians is legendary but where did the supply of Egyptian gold come from? The Ancient Egyptians had access to the richest of all the gold supplies in the Ancient World. The two major sources of Egyptian gold were found in Nubia to the South and in the Eastern desert. How was Egyptian Gold obtained? The Egyptian Gold was obtained by crushing the white quartz rock which was found in the desert and also panned from silt found in the river beds. The nuggets and precious particles of gold were then stored in linen bags and transported by donkey trains back to the Nile Valley of Egypt. The majority of the precious metal was claimed by the Pharaohs and the priests. The skills of the Ancient Egyptian goldsmiths transformed the gold into fabulous treasures which were destined for the palaces or the temples. Gold leaf was created, which was paper thin, and this was used to cover the furniture and tombs of the Pharoahs and also to cover the statues of the gods. Golden jewelry was favored by Ancient Egyptians, men and women alike. The precious metal was used in amulets, necklaces, bracelets, rings, head jewelry and anklets. Because of their religious customs and beliefs their golden jewelry was buried with them. The Tutankhamen Sarcophagus was made of yellow quartzite which was covered with gold leaf. It contained three gold coffins nested within each other, like Russian dolls. Inside the final coffin was the mummy of the Pharaoh Tutankhamen - King Tut. This final coffin was made entirely of gold and contained the mummy of the boy pharaoh wearing a solid gold death mask which was inlaid with jewels. Numerous pieces of golden jewelry including amulets, necklaces, bracelets, rings, head jewelry and anklets were also found surrounding the mummy of King Tut.